Synopsis It is a typical Thursday night and a man and woman are trapped inside an elevator after work. No one from the outside world tries to save them. Strangers to each other, the two wait. To pass time, they talk. They discuss mundane matters and insignificant subjects —from their jobs to their unrealistic dreams. As the conversation develops, an accidental relationship forms, all the while inside the elevator. 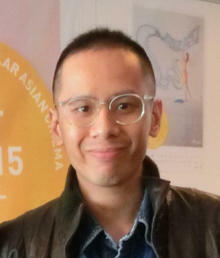 Cheng Tak-yan Enoch is an artist, director and writer. He has produced two short films Queen’s Encounter (2011) and Before Friday (2012) which have been screened in Hong Kong, Shenzhen, Taiwan, Thailand, Italy, and Brazil. His theatre work Fishy Stories was performed in the spring of 2013. In the same year, he shot his latest film I Hope You Don’t Mind during ‘Paper Rain’ curated by Arto Lindsay at Art Basel Hong Kong, and presented his site-specific video installation A One and A Two: What I Cannot Say and video Grounded. His most recent short story Climates was published in the collection A Fictional Residency. — Shared by Cheng Tak-yan Enoch, director of Before Friday after attending 15th Udine Far East Film Festival, under the sponsorship of NAE.